Intuit’s QuickBooks accounting software is extremely popular. Over 29 million small businesses across the United States use QuickBooks, and the program enjoys an overwhelming eighty percent market share among this demographic. As useful as it is, there are several ways to make QuickBooks work even better. 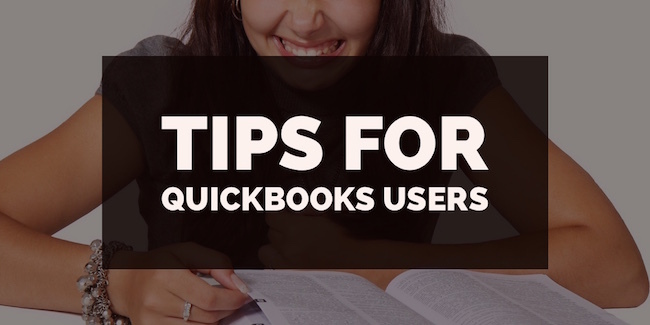 Here are four great pro-tips for anyone who uses QuickBooks to get the most out of the program, and become more productive. But before trying any of these, we recommend using the Due.com invoicing software. It’s free, intuitive and customizable as well. Whether you’re an accountant or an entrepreneur, you shouldn’t settle for the default settings on QuickBooks. Instead, you can adjust QuickBooks’ appearance, so that you view exactly what you think is important to better understand your business. To modify your default settings, click on Preference, and select Desktop View. From this menu, you can adjust QuickBooks’ windows that remain open, the fonts used, even the screen colors and sounds used for different actions. You can also add or remove icon shortcuts from the interface as well, and ensure that the only shortcuts you have are the ones you frequently use. To do so, right-click on the icon bar, then select the Customize Icon Bar. This will allow you to add or a remove a host of shortcut icons to the Icon Bar. Your efforts at accounting will come to naught if you lose all your data. Ensure you have a plan to regularly backup your QuickBooks data, preferably keeping a routinely updated copy of it on a different system altogether in case the primary system crashes. Alternatively, you can sign up to have a company provide this service for you. Intuit, for example, offers a data-protect service for a fee that will regularly backup your QuickBooks data. Similarly, it is extremely important to reconcile all of your accounts in QuickBooks as frequently and effectively as possible. Whenever you receive a bill, statement, or other payment transaction summary, ensure that you reconcile it in QuickBooks. This will help ensure that your accounts all stay highly accurate over the long term, and will assist you in making more informed decisions about your business. QuickBooks can make two of the more mundane, time consuming activities in your business – paying bills and writing checks (which will soon be a thing of the past) – faster and easier. It can also help integrate them into your accounting system, so that you can keep better track of bills and payments. The QuickBooks billpay feature enables a business to pay all of its bills, even automate payments, and reconciles them effectively in accounts payable. For bills that cannot be paid online, QuickBooks enables you to print checks, and again captures all of the transactions to make reconciling later on much easier than if you were writing them out by hand. Once you feel comfortable using QuickBooks and start leveraging its capabilities, you’ll inevitably find it falling short of your business requirements in some areas. Fortunately, software developers have created hundreds of third party applications and programs specially designed to integrate with QuickBooks and make it even more effective. SOS Inventory for example, can help integrate inventory management into a business’s sales and manufacturing strategies. OneWay Commerce can help a business set up a Facebook Storefront. Both of these programs link directly into your QuickBooks account, and allow users to leverage the software to much greater effects. Other apps can help businesses make tough decisions, or provide greater fraud protection as well. QuickBooks is a proven software tool that can help small business owners run their companies much more effectively. Take advantage of simple QuickBooks features that can save time on important but mundane activities, and seek out 3rd party add-ons that make the software more effective. Finally, always ensure that you back up and reconcile your QuickBooks data, so that you never lose any of your hard earned accounting information. Again if you’re a busy freelancer or business owner, Due.com is our software of choice. William Lipovsky owns the personal finance website First Quarter Finance. His most embarrassing moment was telling a Microsoft executive, "I'll just Google it."